The Ford Mustang is an awesome machine and one that, for many, is the stuff of dreams. I remember having a model Mustang when I was about four years old. It was my favourite toy and I cried my eyes out when I lost it. Fast forward forty years and the boy is a man – and driving the real thing. Who would have thought it? The car has been worth the wait. Not just for me, but for many British car-lovers. We tested the left hand drive ‘tang in Bavaria last year, but now it is here in Brit-spec right hand drive, we had to see how the car performed on our very ‘special’ roads. We piloted the 5-litre V8 version – the one that sounds, looks and feels how you would imagine a Mustang to, well, sound, look and feel. It is a sports car you can drive all day, or keep in your garage as a fair weather modern museum piece. Certainly, the appearance of the Ford Mustang is jaw-droppingly muscular, with great streaks of retro sweetness running through it – like a stick of Brighton rock. Underneath the cloak of classic-cool, Ford has clearly been busy engineering a chassis that delivers first-class handling, blended with a pleasingly comfy ride. 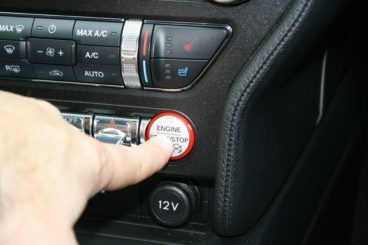 At 70mph, long legged gearing means the power unit is only spinning at 1800rpm, so on motorways, other than the delicious V8 rhythm, there is very little noise. 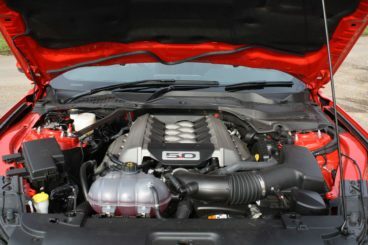 Certainly, the burbling throb of the 5.0-litre V8 power unit is the magnet for many and its pulling power is a grin generator. We stayed in third and fourth on Oxfordshire’s country lanes because we found moving up to the fifth and sixth cogs were unnecessary – for performance. These two gears are best left for motorway mile munching. The car is big, but it never feels unwieldy. Yes, there’s a bit of wallow, but narrow English twisty turns can be taken without issue – and on the straights we achieved Ford’s official 0-62mph time of 4.8 seconds easily. This is doable using the Mustang’s launch control system, which enhances the fastback’s talent for a flawless standing start. The car stops very quickly, too – thanks to six-piston Brembo brakes. The blue oval legend’s gadgetry also consists of an electronic Line Lock, which has its origins in drag racing. Basically Line Lock will anchor the front wheels while allowing the rubber at the rear to spin blue smoke and leave black streaks everywhere. Yes, we know it’s hooligan-like, but the feature is addictive – and great fun when done in the appropriate environment. Some of the materials in the Mustang’s cabin are not the highest quality. The plastics around the dashboard are scratchy and hollow to the touch – but they look the part, so it’s not even disappointing. The car is also well kitted-out with climate control, leather, and a DAB radio. Unlike certain German brands, the options list is short – and won’t empty your wallet. Rear parking sensors and sat nav form most of the extras. The custom pack adds these and a little more – silver wheels, for example, and all for just £1800. Better still, because the Ford Mustang is long, there is decent legroom – and good boot space, too. Okay, the front is where you and your passenger will benefit the most, but the rear seats are functional – especially for a couple of small kids. The V8 model is thirsty, but with prices in the £30-£40k bracket, the muscle-car’s running costs are far easier to take on the chin. Indeed, the 5.0 GT is the lowest-priced V8 machine on sale in Britain, but, you are looking at only 20mpg if you want to use the brute as it should be used. The Mustang is not environmentally friendly either, churning out 299g/km of CO2. This means the ‘tang is in the highest rated vehicle excise duty (VED) tax band in the UK – band M. This costs a whopping £505 per year. Hitched up to an automatic transmission, the V8 does better, churning out only 281g/km – but seeing as VED band M kicks in from 255g/km of CO2, this makes no difference to the price of the road tax. 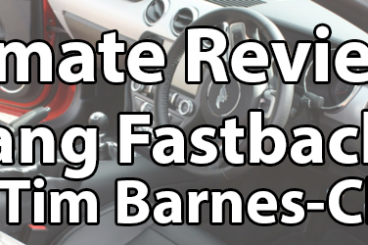 Should you buy a Mustang Fastback? The mighty Mustang Fastback 5.0 V8 GT is first and foremost a muscle car, so it doesn’t quite have the lithe, athletic dynamics of sportier Euro rivals. However, the Ford is an emotional choice and it is a car you will have everybody talking to you about. It has ladles of character and bags of American allure. But the big difference is, it is here at last – and in right-hand-drive guise. So, unlike left-hand-drive imports, seeing to overtake will never be an issue. We Brits have waited a long time – 50 years to be precise – for the Ford Mustang to be available to buy here in the UK, and finally our moment has come. 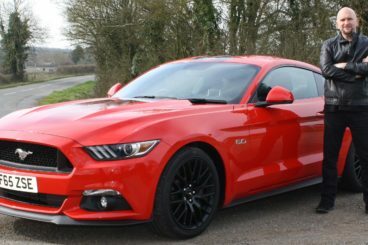 For the very first time your local Ford dealership is offering the once all-American Ford Mustang in all-British right-hand drive, and it is available from just £30,995. The Mustang has some strong competition in the guise of the Audi TT and the BMW 235i, so let’s take a look and see how the American icon shapes up against its main rivals. In design terms, there’s a real contrast between the TT and the Mustang, with the Audi looking forward and the Ford looking back. One is the sports car of the future, and one is a modern take on the sports car of the past. What you prefer is really down to personal preference, but it can’t be denied both machines look stunning in their own way. The Audi TT doesn’t just look modern; it comes with a variety of futuristic touches to make it stand out from the crowd. 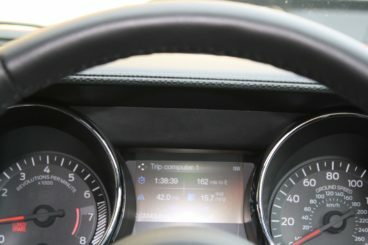 The ‘virtual cockpit’ is the headline here, with a high-definition screen replacing the traditional dials on the dash. It can be customised to show different information and though it can be tricky to get used to at first, it’s a real taste of what’s to come and a brilliant piece of technology. Your experience when driving the Audi TT really depends on the engine you have ahead of you, but only the ‘TT S’ can go toe-to-toe with the Ford Mustang. 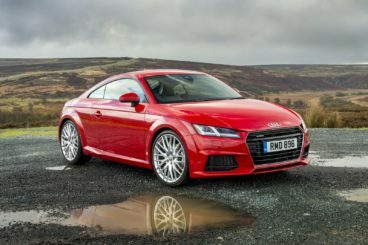 Available just with Audi’s famous ‘Quattro’ 4WD system, the TT S reaches 62mph in a rapid 4.7 seconds. 4WD means it is almost unshakeable on the road, even in horrendous road conditions. Crucially for some, it never really feels all that involving, especially with the ‘S-tronic’ automatic gearbox. As good as it is, it leaves us feeling a little bit detached from the action, and the lack of rear-wheel drive doesn’t help. 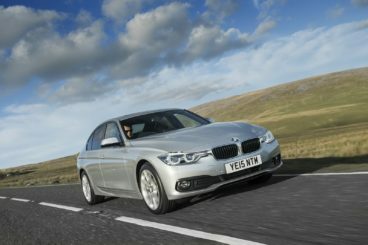 Being rear-wheel driven, the pocket-rocket BMW 235i is perhaps a little closer in spirit to the Ford Mustang than the Audi TT. That being said, it is completely different in feel to the American bruiser. Powered by a modern 3.0-litre turbocharged six-cylinder engine, the M235i certainly doesn’t lack clout, though it is around 100bhp down on the V8 powered Mustang. As it is smaller and lighter it feels like a different weapon altogether – if the Mustang was a mace, the 235i would be a dagger, being far quicker to respond to the driver’s inputs and generally much easier to wield. There isn’t much difference in price between the BMW and the Ford, but you’re almost certain to spend more on the 235i. It starts at £35,225, but as with most of the luxury German manufacturers there’s a wealth of fairly expensive options to choose from. There are of course options on the Mustang, too, but they are fairly limited and, as a rule, you are less likely to spend extra on the Ford. Really, the choice between the 235i and the Mustang comes down to personality and personal preference. The 235i is modern, sharper, and undoubtedly more upmarket – nowhere does this show up more than in interior quality – but is it as much fun as its American rival? There’s really something to be said for the throb and the growl of a solid V8 block, and is any car in history as iconic as the Ford Mustang? 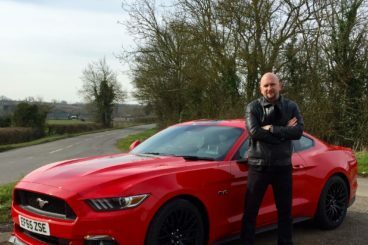 With the V8 under the bonnet, the Ford Mustang is a beefy but charming brute of a car. Many didn’t expect it to be suited to life in the UK, but it’s settled in rather well. It’s the right size and a real character of the car. It’s also surprisingly comfortable, set up to be a little softer than both the Audi TT and the BMW 235i. Drivers who are more fashion conscious may want to consider the safer and more stable Audi TT, while those who prefer precision and luxury to sheer brute force and heritage will find they share a spirit with the more modern BMW 235i. Looking elsewhere there’s a slice of old-school sports car still out there on the new car market in the shape of the Nissan 370Z. Although it isn’t available as a convertible, its normally aspirated 3.7-litre V6 is an enormous amount of fun, and it could be argued it’s one of the last of its breed. There’s also the exceptional Porsche Boxster or Cayman – depending on your preferences of roof – to consider. They are two of the finest sports cars on the market, but don’t have the character or history of the Mustang. They’re also going to be much more expensive after you’ve added on some of those famous Porsche options.